Hi, Anyone encounter any error? My friend just tried to sign up and there is an error on the code. Guess he is going over to NTUC JEM to sign up later. QUOTE=darkmilk;115956115]PM sent, do check your inbox. Thanks in advance! Do enter the promotion code HAPPY53 too. You can visit Geneco roadshow at NTUC Fairprice at JEM shopping mall, next to Jurong East MRT station for a chance to win extra vouchers at their spin and win. The referral program, promotion code and roadshow spin and wheel are all mutually inclusive. The promo code HAPPY53 entitle you to $53 off your first bill. Today is the last day for the promo code. It is limited to the first 530 users who use the promo code and only applicable for sign-up of 12 or 24 months plans. Is your error referring to the promotion code HAPPY53?? 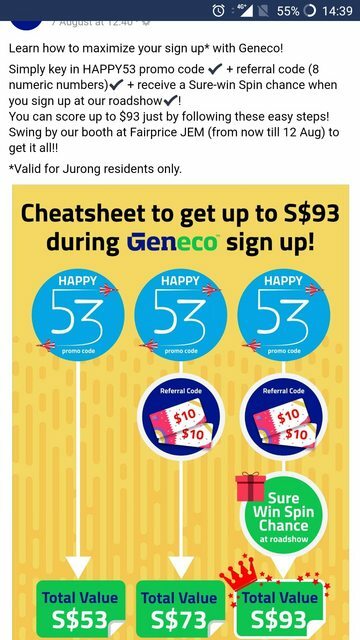 The Happy53 error might be due to 1st 530 slots being taken up already... not sure if Geneco indicated in their website or FB on this. If you are signing up online, there is only 1 field for the code thus once you are able to input "Happy53" you won't be able to input a referral code...no double stacking of promos. But if you signup at a roadshow as I shared before, you can win up to $20 vouchers in additional thru a lucky spin. So next best thing is to signup at a roadshow for referral bonus signup + lucky draw spin...but do note there have been feedbacks of rogue roadshow promoters who have "forgotten" to input the referral code you wanted to use and input their own instead. Do flag out if you encounter this. Last edited by jeremysv; 12-08-2018 at 02:40 PM..
PM sent, do check your inbox. Thanks in advance! @jeremysv I think it would be better if you could double check on the information that you're going to share with others. Last time round, you advocated other people to use the $25 reseller code instead of the referral code, in which, after clarification from Geneco, it turned out that the reseller code is only use for tracking purposes and there is no $25 vouchers given for it. 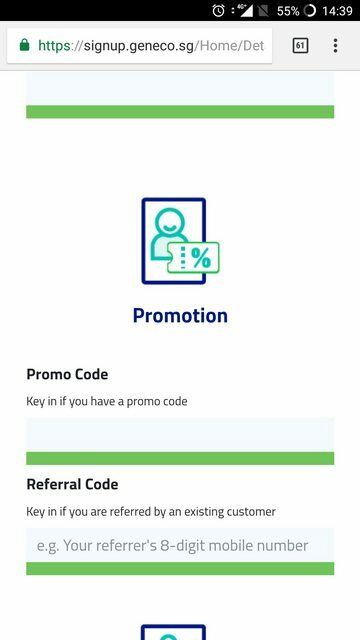 There are separate fields for promo code and referral code as showed in the picture below. So you can actually enjoy both referral vouchers and HAPPY53 discount (only with 12 or 24 months plans and limited to 1st 530 users) plus roadshow lucky spin if you're sign up at the roadshow. So all three can be stacked as evidenced in the picture below. If you're lazy to check on the accuracy of the information, which you're going to share with others, then just don't share it anymore. Knn everytime waste my time to correct you from misleading others. @Mama123 Hi, probably the HAPPY53 promo code has already reached it quota limit of 530 sign-up. Furthermore, you've to sign up for a 12/24 months plan to enjoy this promo code. You can try to ask the roadshow guys whether the quota limit has already been reached or not since their hotline is closed now. Last edited by darkmilk; 12-08-2018 at 03:19 PM.. It was during a call with Geneco CS that that i was informed that Happy53 cannot be stacked with the referral code as there's only 1 entry field thus I been sharing it that way. I did not go thru the experience of going online to signup during this particular promotion combination. Think about it..how does it benefit me telling people it cannot stack? If i knew it can stacked..won't i benefit more from promoting my referral code as well? I was informing people to goto roadshow to sign up for $53 credit + lucky draw spin and getting nothing out of it since thats the best combination or max value to my knowledge at that point - I didn't force anyone to sign up online so I can benefit. In other words, I do not advise only when it benefits me. My thoughts was what if upon further clarification Geneco shared somehow the reseller was able to offer this $25..just they didn't explicitly mention yet in their earlier replies..so rather than give absolute confirmations as if I am official Geneco rep, I didn't disclaim but continue to provide to whoever specifically requested for the $25 reseller code. Only after Geneco written explicitly back to me via email to say the reseller code is not recognised as a referral promotion code thus I posted the official reply i got. So before you go ballistic again, frankly this is forum board where people are sharing and we are sharing to the best of our knowledge but if you want to come from an angle where only people who are 100% correct can reply..then perhaps it should not be an open forum...instead we should get official OEMs to reply only. But since that's not the main intent of an open forum, i appreciate that you share its actually possible... sharing it further clarifies and serves to be better for everyone... that being said, I am only sharing what i know to the best of my knowledge... if you or whoever knew something which was different, by all means share it and all can benefit from it. Last edited by jeremysv; 12-08-2018 at 05:42 PM..
Walan eh, using Geneco CSO as your meat shield again. I didn't go through the experience of signing up during this particular promotion combination too and yet, at least I will check on the accuracy of my information that I share with others. Even though this is an open forum, some users if not all, may take your words for it and in turn, they will be deprived of an opportunity to enjoy their rightful benefits. Please have the decency to verify the information that you share, especially more so when it can simply be done by looking up Geneco online form and their Facebook page. I really doubt that the CSO whom you spoken to, passed you the wrong information about simple thing such as there is only 1 entry field on their online sign-up form. Lastly, it is not about you benefitting from it or what. It is that you should at least pass on what you're sure of instead of some half-baked knowledge. But even when i was not correct on how the promo stacking works, the better option is indeed to sign up at a roadshow instead of going online and missing out on the lucky draw spin. So tell me based on my advice for them to sign up at roadshow instead as the better option deprives them of what - Do you mean to say at a roadshow signup the promoter will not provide what is rightfully the consumer benefit and follow what i say instead? Seriously? I had shared even if it didn't benefit me to sign up at the roadshow at that point until today after you helped to clarify. But now thankfully to you, a shoutout to all who read my sharing and signed up during the roadshows to use my referral code to stack. PM me to get my referral code and we can seek Geneco CS help to add my referral code into your signup. Last edited by jeremysv; 12-08-2018 at 06:16 PM..
You can't say for sure that they will head down for the road show lucky draw spin although most of them will. Even if they head down, since you already said it isn't stackable, they may not ask the promoter about it and assume as it is. What's more, the promoter may or may not mention about it too. Hence, they may miss out on the benefits which they can get for signing up and that is rather frustrating for them, considering the extra admin work which you caused to those who use your reseller code. The stigma of the past incident just linger in you. I don't know what's wrong with you but I didn't mention it is wrong of you to advise them to sign up at the roadshow for the lucky draw. In fact, I also recommend them to do so. Last edited by darkmilk; 12-08-2018 at 06:33 PM.. Even if they head down, since you already said it isn't stackable, they may not ask the promoter about it and they promoter may or may not mention about it too. Hence, they miss out on the benefits which they can get for signing up. Thus i agree with you, if the promoter missed out on the stacking, for all the roadshow signups due to reading my post to PM me so that we can now add on what they missed out to let them fully maximise what they can get and as a plus point, i benefit as well. Last edited by jeremysv; 12-08-2018 at 06:31 PM.. Initially, I've already shared the correct information but you tried to correct me with your wrong information and using Geneco CSO as meat shield when being corrected. Everyone is prone to errors but don't ji ji wai wai when being refuted, all the more when you're correcting the person (ME) who spent the effort to verify and gave the information before you did so with your false information. End of the day, from the way you're speaking, I think you assume it's alright to cause extra admin work/process to those people who believed your information. I shouldn't continue on with you and let the users pass their own judgement on you. It's ok with me but with your last few posts you seem abit too sensitive and keep going ballistic like I insisted what you share is wrong which i didn't but that's you i guess. This is so obviously evident from all the post replies we made which the readers can use to make their own judgement. Since this is an open forum, anybody can share what they want but its still up to the individual to make his her own decision. The most accurate and latest info is from the OEM themselves, not from open forums unrelated to the OEMs. The users here share what they know at any given point and anyone can always update the information shared if there are slightly different understanding. Last edited by jeremysv; 12-08-2018 at 07:39 PM.. There's roadshow at Jcube currently. Anyone knows if there's any good promo? You just missed the SG53 promo which was quite attractive. But overall as of today, Geneco fixed rate 24 mths plan is the lowest and covers the absorption of TLF, security deposit waiver and free AMI smartmeter installation. You can get a free lucky draw spin during a roadshow signup and win up to $20 dairy farm shopping vouchers on top of the referral code which I have sent based on your PM. Do check your inbox. Last edited by jeremysv; 13-08-2018 at 03:40 PM..
absorption of TLF, security deposit waiver and free AMI smartmeter installation. Yesterday promotion offered these too?